Abstract: “Kola” presented for suspected neck pain and forelimb lameness issues. He was diagnosed with having a concurrent mixed bacterial and fungal otitis, and on the second to last and last treatments, also had developed a seroma as a consequence to trauma. A further workup was not allowed due to financial constraints. Kola had a total of six treatments performed at intervals of 7-10 days between treatments. 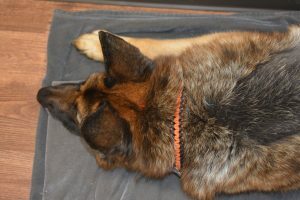 Kola was incredibly responsive to his acupuncture treatments according to the owner. His mobility and desire to jump and exercise improved almost instantly after treatment. His owners have noted that he wants to play more, seems less anxious, and is more interactive with them. They are planning on continuing with acupuncture treatments beyond the case study. 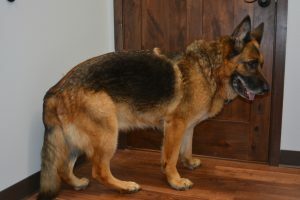 History and Presentation: Kola is an 8.5-year-old male neutered German Shepherd Dog that presented for evaluation for suspected neck and forelimb pain after intense activity. The owners have noticed postural changes such as being unwilling to raise his head, and also intermittent bilateral forelimb lameness. Kola has been slowing down over the past few years; owners are assuming this is age related. The owners have noticed gradual behavioral changes with Kola over the past few years; he used to jump on and off of the furniture readily, used to jump into the car and sleep in the bed with them. He now usually sleeps on the floor or on a shorter bed with one of their children, and requires assistance into their vehicle. Owners have also reported progressively increasing separation anxiety and overall generalized anxiety with no associated lifestyle changes. Kola is still active: he is usually taken for leash walks with a collar 3 days a week, and also will play regularly with the neighbor’s dog. His overall energy level seems to remain the same but he seems to be less interested in continued exercise after exercising for a few miles. He is primarily housed indoors on a mixture of carpeting and laminate flooring. 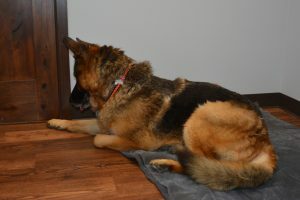 Kola was previously diagnosed and treated for Lyme disease in 2011, and seems to have made a full recovery. A few years ago, Kola also obtained a small laceration on the left front foot that required surgical repair. Kola has no known allergies, but has had previous ear infections. He is being fed a sweet potato and salmon based diet, but also does receive treats. He is not currently on any medications or supplements. He is apparently up to date on vaccinations, and does not receive routine parasite preventatives. Physical Examination and Clinical Assessments: Kola was found to be bright, alert and responsive, and had a normal temperature, pulse, and respiration. He was an ideal body condition score. He has grade 2 periodontal disease and mild to moderate generalized attrition. He was found to have lenticular sclerosis bilaterally. Both ears (AU) were hyperemic, stenotic, and had mild-moderate yellow tinged discharge. Otoscopic exam revealed intact tympanic membranes AU and no foreign bodies or masses were noted. Thoracic auscultation was within normal limits. Kola was tense, but was not found to be painful on abdominal palpation. Thickening, boney changes, and crepitus were present on palpation of both elbow joints, and a reduced range of motion (ROM) was also noted in these joints. Kyphosis was noted in the thoracolumbar (TL) spine, in addition to sensitivity on gentle palpation of this region. A ventroflexed neck was noted during ambulation and when standing. Conformationally, Kola’s hind end is much lower than his front end. Coxofemoral joints both showed a reduced ROM and were stiff on extension bilaterally. Kola was quite anxious but well behaved for his physical exam. On treatment #4, a 2.5 inch, fluctuant, painful subcutaneous swelling was noted on the dorsal thoracic spine between the scapulae. Neurological examination: Neuroopthamalic and cranial nerve exams were within normal limits. Extremely mild conscious proprioception (CP) deficits were appreciated with both thoracic limbs (righting and withdrawal reflexes were slightly delayed). Kola was extremely reactive with panniculus reflexes near the TL junction, but reflexes were otherwise intact. Pelvic limb exam showed that patellar reflexes were increased bilaterally, righting and withdrawal responses were slightly delayed (slightly slower than the thoracic limbs), mild CP deficits were noted, and there was no crossed extensor reflex noted. Myofascial exam: Trigger points were noted in the left temporalis muscle. Generalized myofascial restriction and multiple trigger points found in the left and right mid-caudal cervical spinal regions (left side was more sensitive than the right between 1st-4th treatments). Both descending pectorals were sensitive to palpation. Generalized elbow discomfort noted, which was worst near the lateral epicondyle bilaterally near the insertion of the extensor carpi radialis muscle. Triceps trigger points and latissimus dorsi trigger points were noted bilaterally, but were more sensitive on the left side. Haircoat changes were noted in the latissimus dorsi and TL junction regions on first treatment. Tenderness to palpation was noted between T10-L3 disc spaces. Quadriceps and adductor groups were hypertonic and well developed, and had multiple trigger points noted bilaterally. Hamstrings groups were atrophied and hypotonic bilaterally. There was mild-moderate generalized hind end muscle atrophy. Laboratory results: Ear swab cytology confirmed a mixed bacterial and fungal infection bilaterally. On the 4th treatment, fine needle aspirate (FNA) of the swelling was consistent with a seroma. All other diagnostics were declined due to financial constraints. Other therapies besides acupuncture and manual therapy: Surolan AU, Keto-triz flush AU, Flexadin chews orally once daily, gabapentin 300mg orally twice daily, stretching and massage exercises recommended that owners can perform at home between treatments. Differential Diagnoses: Cervical and TL pain: fibrocartilaginous embolism, vascular myelopathy/ ischemia, Borrelia burgdorferi, ehrlichiosis, discospondylitis/ vertebral osteomyelitis, osteoma, osteosarcoma, degenerative joint disease, compressive myelopathy, spondylosis, intervertebral disc disease, Vitamin D/ fluoride toxicosis, polymyositis, myasthenia gravis, stress fracture/ subluxations, hyperparathyroidism, exertional myelopathy, secondary myofascial strain patterns related to chronic forelimb lameness and otitis. Elbow pain: Borrelia burgdorferi, ehrlichiosis, panosteitis, hypertrophic osteodystrophy, osteoma, osteosarcoma, degenerative joint disease (DJD), osteochondrosis dessicans lesions, congenital elbow luxation, elbow dysplasia, Vitamin D/ fluoride toxicosis polymyositis, polyarthritis, systemic lupus erythematous, stress fractures/ fragmented coronoid processes, insertional tendinitis pathology, and enthesiopathy. Definitive (or Putative) Diagnosis (or Diagnoses):Unfortunately, radiographs and/ or advanced imaging were not allowed due to financial constraints. Based on my physical, neurological, orthopedic, and myofascial exams, my top differentials are: Cervical and TL pain: Cranial thoracic myelopathy/ pathology, in addition to chronic compensatory myofascial dysregulation from thoracic limb pain are suspected. An asynchronous gait, thoracic limb flexor atrophy and hypertonic extensors, and crossed extensor reflex are all not appreciated with ambulation, making a caudal cervical myelopathy less likely. Upper motor neuron signs were noted in the pelvic limbs and mild lower motor neuron signs were noted in the thoracic limbs, helping localize the suspected lesion to the C6-T2 spinal segmental regions. Elbow pain: Based on exams and signalment, bilateral elbow degenerative joint disease is suspected. This could be secondary to primary elbow dysplasia or an adverse effect secondary to having Lyme disease. Medical Decision Making: The medical acupuncture and integrative neuromodulation (MAIN) technique was used to arrive at my treatment rationales. My main goals with Kola were to alleviate pain and muscle tension, improve autonomic dysregulation, and help with emotional and immune support. Therefore, my focus of treatment was not just on the needle to tissue interface, but also with intension on influencing the central, peripheral, and autonomic nervous systems in addition to the myofascia. 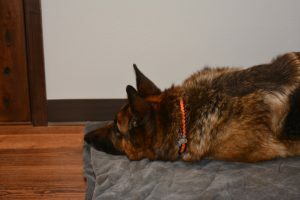 Acupuncture Treatments: The same acupuncture point approach was used for each treatment, and sometimes Kola would tolerate the placement of extra acupuncture needles. Additional points were used will be stated treatment to treatment. A total of 6 treatments were performed, and intervals between treatments were between 7-10 days in length. Needle selection: Seirin J type coated 0.16mm-0.2mm were used depending on the treatment and location (wanted to make earlier treatments or very stimulating points less stressful with smaller gauge needles, but found that it was more difficult to advance 0.16mm needles if there were large muscular bands or trigger points). I used various needle lengths between 15mm-30mm depending on the location, desired depth, and coat length. For example, if GV 20 was being used, generally a shorter needle length was used, where if GB 29 was chosen, a longer needle was used due to haircoat length and wanting to deactivate deeper trigger points (ex: deep gluteal muscle). Unfortunately, only dry needling and manual therapy were used for this study as my clinic did not currently have access to laser or an electrostimulator, which could be assets with future treatments on Kola. Treatment length varied from 10-15 minutes in length, depending on how Kola was tolerating the treatment. Manual therapy, such as massage, skin rolling, stretching, and passive range of motion exercises, were performed following each dry needling session for an additional 10-15 minutes. Kola in general had high anxiety for his treatments and exams. He was very food motivated, but often got too excitable and would not relax after food was used. The most success with relaxation was noted if he was ignored by myself, the technician and the owner during treatments, and if he was allowed to move around in the exam room without being interrupted. It generally took around five minutes after placing GV 14, 20 and Bai Hui for him to lie down. Treatments after he was lying down were much more successful. Treatment #1 and #2: Used GV 14, GV 20 and Bai Hui as initial points hoping to get Kola to relax. Five minutes were allowed until Kola was in a more relaxed state before proceeding further. GV 14 was selected due to its effects with relaxation, thoracic limb pain and weakness, cervical muscle tension, and immune regulation. GV 20 was used primarily for its relaxation effects, use for autonomic dysregulation and anxiety, and impact on multiple neurovascular pathways (ie occipital nerves from C2-C3, trigeminal nerve branches, upper cervical spinal nerves, vagus nerve). Bai Hui was selected for its impact with autonomic dysregulation, pelvic limb dysfunction, and lumbosacral (LS) pain. Once Kola was more relaxed, GB 21 was applied bilaterally to help with neck and shoulder tension and thoracic limb dysfunction. Hip triad points (GB 29 and 30, BL 54) were applied bilaterally to help with hip and gluteal pain, and sciatic pain and dysfunction. BL 18 was chosen bilaterally due to local pain and TL dysfunction, and finally BL 23 was chosen bilaterally for local pain, TL dysfunction, pelvic limb pain, and lumbar pain. Kola tolerated treatment #2 better, as he relaxed much more quickly. Massage was used primarily on cervical, pectoral, triceps and latissimus dorsi, thoracolumbar, and adductor group trigger points. Treatment #3: Treatment approach was similar to treatment #2. Kola tolerated some additional points: LI 11 was chosen bilaterally for its impact on lateral elbow pain, immune modulation (increase in T-lymphocyte production), and its anti-inflammatory properties. BL 10 was chosen bilaterally for its impact on the central nervous system, and for cervical and thoracic limb pain. TH 10 was chosen bilaterally because the triceps groups had multiple trigger points, palpated to have restriction, and were sensitive on palpation bilaterally (L>R). Treatment #4: Kola was diagnosed with having a large seroma between the scapulae on today’s treatment after digging underneath a fence and sustaining trauma, and was quite a bit more painful and reactive than treatments #1-3. Kola only tolerated points from treatment #2, and I felt that it was best to discontinue the treatment at the 10-minute mark due to him being agitated. Treatments #5 and 6: Kola still had some fluid within the seroma, but was not painful on palpation. On the last two treatments, it was noted on myofascial exam that Kola had more cervical trigger points on the right side (treatments 1-4 had more palpable trigger points on the left). Kola tolerated all of the points listed from treatment #3, in addition to a few more points: LI 4 was chosen bilaterally as it is the ‘master’ point for the head and neck: it treats oral pain, helps with sympathetic regulation, has cervicothoracic reflexes, helps thoracic limb pain, and treats dermatological problems. ST 36 (chosen bilaterally) helps counter sympathetic overactivation with acute and chronic pain, helps with immune and inflammatory problems, and pelvic limb pain. Cervical trigger points (unnamed) along the omotransversarius muscle group were also chosen due to local pain and myofascial restriction. Outcomes, Discussions, and References: Kola responded very well to his acupuncture treatments. Ambulation and postural changes throughout treatment are noted both in the images and videos provided. Kola started with having a ventroflexed cervical spine, which has improved to normoflexion. A reduction in kyphosis is noted in the TL spine. Ambulation seems to be more free and fluid, and there is less notable bilateral forelimb lameness. Myofascial pathology palpated to have improved throughout the course of treatment. The otitis resolved and seroma improved (both are likely only minimally related to acupuncture). Kola’s demeanor for handling and treatments improved markedly: he was extremely high anxiety to start and was much more relaxed and interactive for follow up treatments. 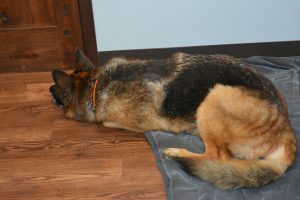 The owners have noted a huge improvement at home with Kola’s mobility. He now willingly jumps into the car and onto their beds, which he has not done in at least 3 years, and they have not appreciated a ventroflexed neck. They report that his demeanor has also changed. He seems to experience less anxiety, seems to be more comfortable, and initiates play more than he used to. I feel that these appreciable effects noted are primarily from acupuncture and the manual therapy initiated. The neutraceuticals have been continued throughout which may have some effect on inflammation and pain control, but the gabapentin was only intermittently administered during the treatment course. The owners also reported that they were not very compliant with at home massage and stretching. Such a vast improvement has been made, almost immediately following treatments, that I am convinced that acupuncture was the primary influential factor to improve Kola’s comfort, mobility, and emotional regulation. I have learned a great deal from this case. With Kola, due to his high anxiety and high food drive, it was found that he was able to relax without food much more readily than with food. He became too excited and overstimulated with the presence of food, that he was not able to relax well. He also would have days that he would handle acupuncture more readily than others. The 4th treatment was the most notable- he had difficulty settling down, and quickly became anxious. I needed to adjust my acupuncture approach each time depending on his mental status, myofascial exam, and concurrent issues (seroma). Matern, C. (2012). Acupuncture for Dogs and Cats a Pocket Atlas. New York, NY: Thieme. Robinson, N. G. DO, DVM, MS, FAAMA. (2016). Integrative Medical Acupuncture Anatomy. Jackson, WY: Teton NewMedia. Robinson, N. G. DO, DVM, MS, FAAMA. (2015). Medical Acupuncture for Veterinarians: Canine Point Mini-Manual. OneHealth SIM Inc.